We’re celebrating BERNINA’s 125 Years Golden Anniversary with more fun feet facts. Yesterday, we shared some history behind our feet and some current favorites. Today, we’ll take a closer look at some of our oldest and newest feet and we have a fun giveaway for you as part of our celebration! One lucky WeAllSew reader will win a copy of the BERNINA Big Book of Feet, scroll down to the bottom of the post to see how you can enter for a chance to win. 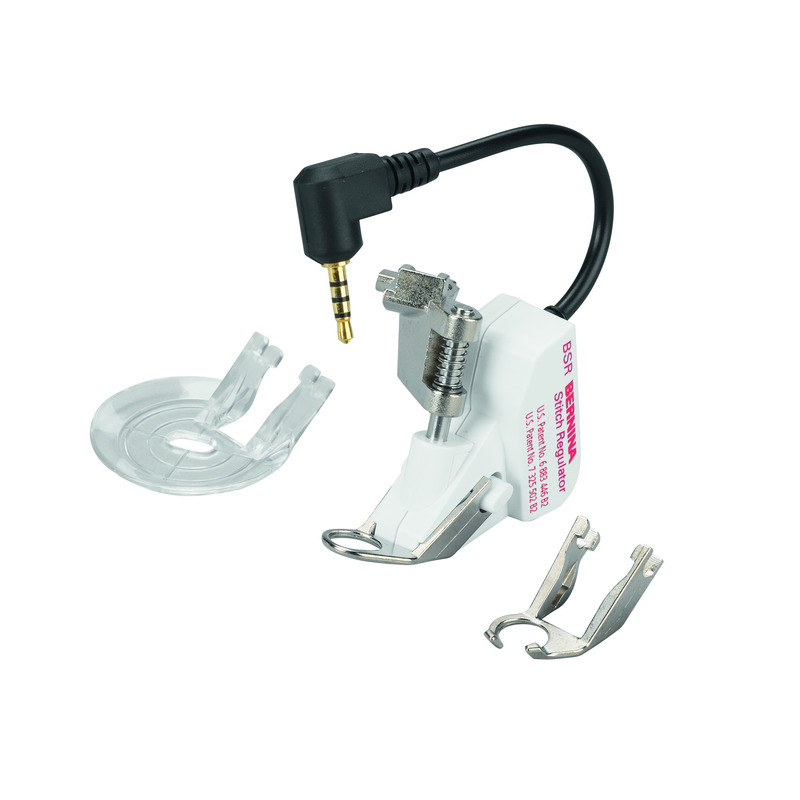 BERNINA has a long tradition of manufacturing innovative feet and accessories to help you with different techniques. If you can dream it, BERNINA feet can do it! You can watch a fun video that shows some of the BERNINA feet being made in our factory here. Out of our huge family of feet, several have been around since almost the beginning, while still other accessories are brand new. 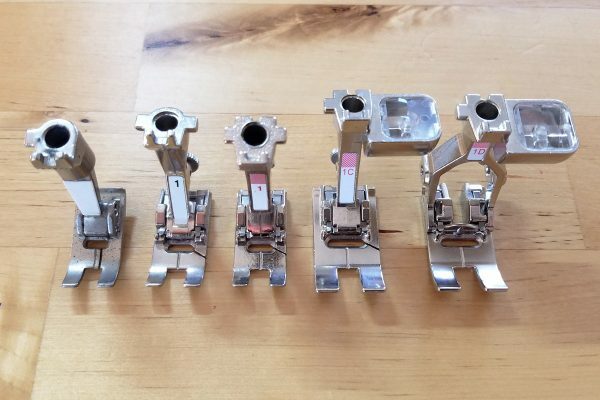 Take a look at some of our favorite BERNINA feet old and new. 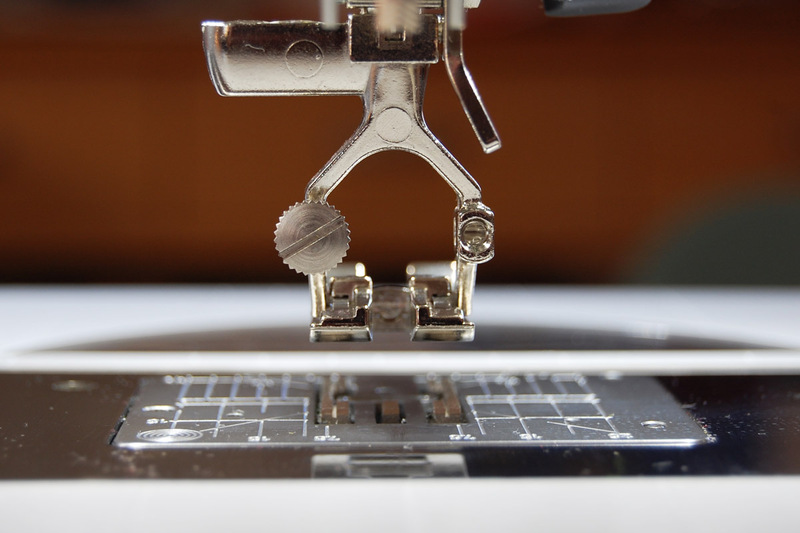 The darning foot has been around almost since the first BERNINA machines were manufactured. While the basic design of this foot has changed little, there are more ways we sew with the Darning foot #9 today than when our grandmothers first used this foot. This is an old style BERNINA darning foot pictured above from a time before feet were identified by number. The name of the foot is taken directly from its original use in darning, a repair technique to fix holes in clothing where the fabric was moved back and forth underneath the needle with feed dogs lowered. Unlike most other feet, the darning foot is not designed to come in contact with the feed dogs. The spring-loaded foot presses down on the fabric as the needle raises up to form nice, even stitches and help prevent flagging or lifting up of the fabric. The sole of the foot is a circle with one slightly straight edge at the front, supporting the fabric around the needle while still offering a good view of the sewing action. The current Darning foot #9 has been engineered to give you maximum visibility when stitching and maintain that quick spring action. 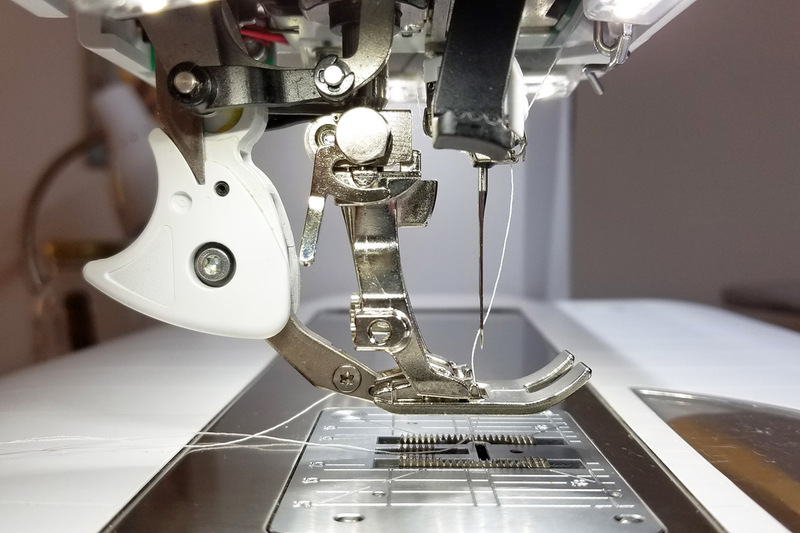 The shape of the needle opening hasn’t changed since those good ol’ days, but it turns out this foot is not only ideal for free-motion quilting with straight stitches, but it also will accommodate zigzag stitches up to 5.5mm in width. You can read about why this foot is a top favorite of BERNINA Ambassadors for all the reasons above. And you can learn tips to use this foot for free-motion stitching here! This is such a useful foot, we’re sure to see it around for many years to come. The first BERNINA zigzag models were manufactured in the 1940’s with exciting new decorative zigzag stitches. A new style foot was needed to help form these stitches, and the BERNINA zigzag foot was born! 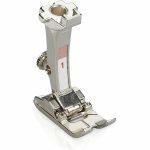 As BERNINA continued to incorporate new technology and innovations into machines, this foot evolved through several generations. In the photo above you can see an early version of the BERNINA zigzag stitch foot to the left, also known as Zigzag foot #0. This first generation of the zigzag foot was designed with a smooth, flat sole to hold the fabric firmly against the feed dogs with a small indentation behind the needle opening allows the thread to form stitches as fabric passes under the foot—check it out in on the left in the photo below. The first generations of BERNINA zigzag machines formed stitches behind the needle, which is why the indentation is seen only behind the needle opening. Exciting innovations brought a new generation of BERNINA models in the 1980’s that were equipped with decorative zigzag stitches that formed with a back-and-forth stitching motion. A new kind of foot was needed to accommodate these stitches, and the BERNINA engineers invented the Reverse pattern foot #1. This zigzag foot included an indentation in the front and the back of the needle opening to accommodate the formation of those stitches forming with a back and forth stitch motion, see this foot in the photo above and below, second foot from the left. As BERNINA continued to engineer new technology and features into new models, the Reverse pattern foot #1 was also updated. The Reverse pattern foot #1C foot pictured above was created for models with a maximum stitch width of 9mm, so it has a much wider sole to work in conjunction with the larger feed dogs. The “C” feet are coded, and can work with machines with a sensor to engage a wider stitch. 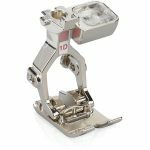 The newest member of the zigzag foot family is the Reverse pattern foot #1D, made to work with the Dual Feed feature on select BERNINA models. The Dual Feed aids in feeding all layers through the foot at the same rate. The “D” feet have a slot in the back made to accept the Dual Feed mechanism. Here, you can see the Reverse pattern foot #1D attached to the machine from the back. See the groove right in the center of the foot? After attaching the foot, the Dual Feed mechanism is pulled down and engages in this slot, as you see above. 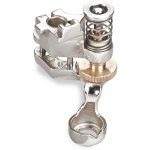 The BERNINA Stitch Regulator (or BSR for short) is one of the newer accessories in the family, first introduced in 2005. 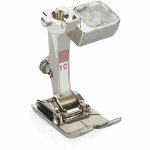 This innovative presser foot guarantees consistent and even stitches when you are free-motion stitching, regardless of your sewing speed. The BSR was developed by BERNINA engineers to work similar to a computer mouse by detecting the movement of fabric under the foot using an optical sensor. 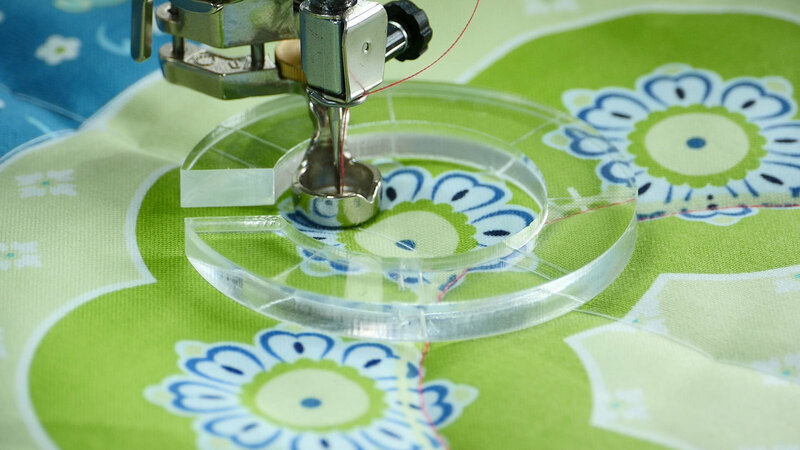 If the fabric is moved slowly or quickly, the sewing speed of the needle adjusts accordingly to match your pace. The BSR also has two modes that can be set for an experienced or less experienced sewist, and it can be used as a straight stitch or zig-zag to create detailed free-motion embroidery, intricate quilting, appliqué, thread painting and lace-like designs. The BSR comes with 3 seperate soles; a clear sole for echo quilting, an open toe foot, and one closed toe foot that as you can see above looks just like the good old Darning foot #9. Perfect for free-motion quilting! Learn more about using the BSR for free-motion stitching techniques in these posts. Top 5 Tips for Successful Free-Motion Quilting, Quilt Embellishing With Decorative Stitches, and Free-Motion Quilting With the BSR. Welcome the newest member of the BERNINA foot family, the Adjustable Ruler foot #72! 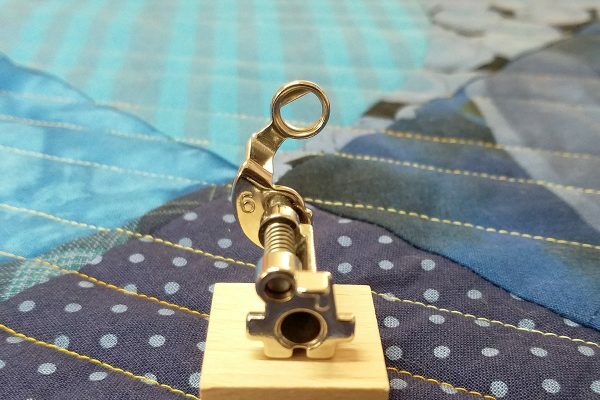 This foot was engineered to allow you to sew with longarm quilting rulers on a domestic BERNINA machine to create decorative quilt designs like lines, feathers, circles, and more. You can use any 1/4 inch thick plexiglass longarm quilting rulers with this foot, and BERNINA also offers a selection of beginning sets of rulers to get you started. The height of the foot’s sole makes it possible to quilt along all the edges of these rulers which is of utmost importance especially with circles. To use the Adjustable Ruler work foot #72, the feed dog is lowered and the fabric with the ruler is guided by hand with the edge of the ruler resting against the foot. 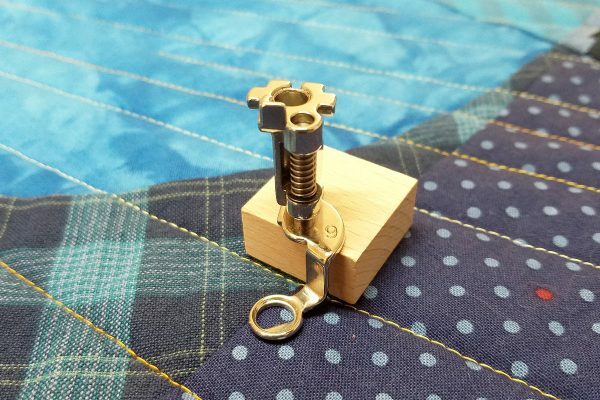 The adjustment dial allows you to move the height of the foot up or down to match the thickness of your quilt and still be able to move the fabric easily under the foot. Want to learn more about this new foot and technique? 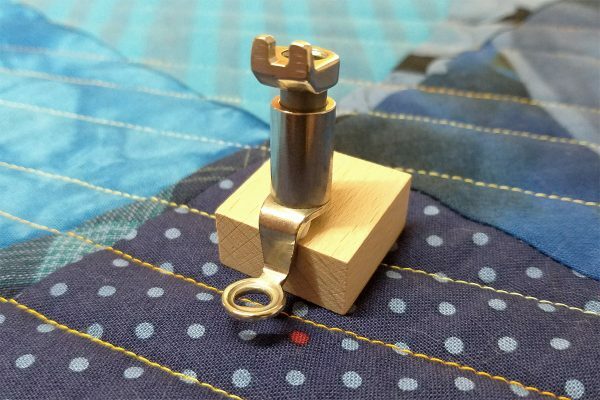 Watch a series of short video tips to get the idea of how to free-motion quilt with rulerwork in the Adjustable Ruler foot #72 Tips and Tricks post. 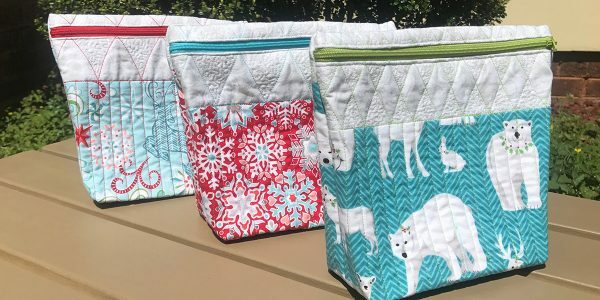 Put your rulerwork practice squares to good use by making your samples into zippered bags with the Zippered Rulerwork Bags tutorial. Make a rulerwork sampler quilt to build your skills with the BERNINA Rulerwork Quilt-along posts. What will BERNINA think of next? 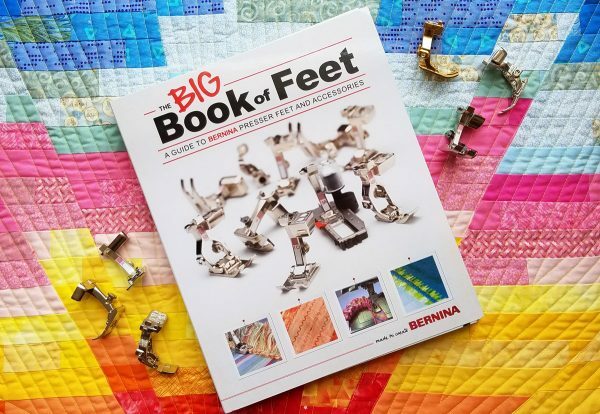 WIN a copy of the BERNINA Big Book of Feet! One lucky WeAllSew reader will win a copy of the ultimate guide to BERNINA presser feet and accessories, the Big Book of Feet! 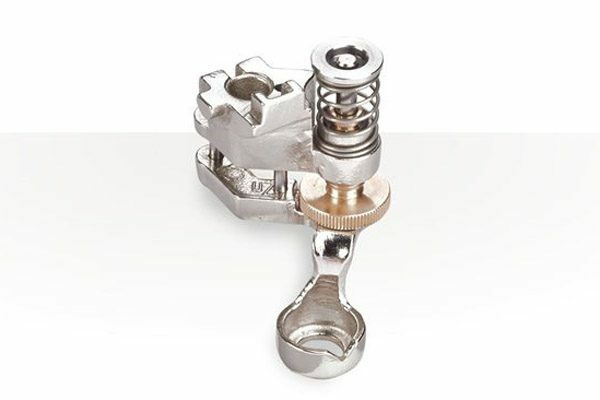 This guide to BERNINA presser feet and accessories includes information on the basics of each foot, which techniques to use the foot with, and tips for getting the most out of your BERNINA feet and accessories. All you have to do is post a comment below and answer the question, “What is your favorite presser foot, and how do you use it?” The the giveaway is open through Friday, March 30, 2018! The giveaway is open to residents of the 50 United States and the District of Columbia. One comment per fan. Comment must be submitted to the WeAllSew.com blog by Friday, March 30, 2018 at 11:59 PM Central Time. Winner will be chosen randomly. Winner will be notified by email and will have 48 hours to contact to claim the prize. My favorite foot is the 10D Edgestitch. I LOVE to use it for top stitching, understitching, stitching in the ditch, heirloom stitching, applying lace and other techniques that require precision stitching. I love the 1/4 inch foot for quilting patterns. I found the one that fits my 1976 number 830 Bernina machine and I love that I can get some of the newer feet to fit my old machine! I enjoy using the !/4 inch foot as well. It makes it easy to keep the 1/4 inch seam allowance for quilting. Not only for topstitching, but for joining two pieces of fabric together, and can be used with so many different stitches to get proper alignment. CAN NOT LIVE ( I mean “sew”) WITHOUT!! My favorite foot is the BSR. It has helped me master free motion quilting and allowed me to make all my quilts my creations from start to finish. Oh how I Iove my 10D!! It is my go-to for any task that requires a small and accurate stitching line such as flawless topstitching, stitching in the ditch, or any time I need a guide to achieve accuracy. That innocent looking little guide is one big task master! My favorite Bernina foot in #35 for the invisible zipper. It makes a hard job easy and it’s done in a ‘zip’. 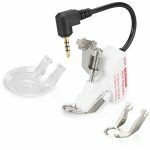 My favorite foot is the teflon zigzag foot – 52D – it’s versatile and allows me to sew on vinyls without using tissue paper. My absolute favorite foot is the BSR. What a great convenience. Thank you! As am taking a free motion quilting class, the BSR foot is my favorite at present. I am intrigued with the new Adjustable Ruler work foot #72, but have not yet tried it. My favorite foot is 34c and 34d. I love the clear sole feet. When your older, it’s so much easier to see your work. It helps with seeing the needle placement. I don’t wear glasses have great vision, but I like to see what I’m doing. I LOVE the 97D foot! With the guide in place, my quarter inch seams are perfect! I enjoy all the Bernina feet I own. What joy it is to be able to sew different stitches with a particular foot that makes the finished project so special. Bernina feet are the best. To choose one it would depend on what I am doing at the moment. Right now I am doing free motion quilting with the ruler foot and it is wonderful for what I am quilting. Thanks Bernina for my super sewing machine the 880 Plus and for all of the great feet and love the Ruler Foot. Have you tried a horizontal spool holder, metallics kink less & break less. I use on with my 830 and it did the trick. After trying various brands of metallic thread, various unspooling techniques and trying all the tricks, I have to agree with you that the 880 does not handle metallics or the “invisible” threads. My Brother 10 needle handles these with ease. Traded in my 880 for the 790 plus. Haven’t had a chance to try it yet with these threads. I use the open toe foot (foot 20) most of the time. I like being able to see where I am sewing. I like to make mug rugs and cards. Definitely #10 for edgestitching,topstitching and under stitching. This one never gets put back in the case! My favourite foot is 10 Edgestitch. I use it for stitching in the ditch, top-stitching, applying ribbon and other embellishments, joining fabric together…. It is so versatile and well made. I am relatively new to the beauty of Bernina but I am certainly smitten. My favorite foot is the #20 applique foot, since I love applique. I also use it for applying bias tape for stems or stained glass. Love my Berninas. My favorite foot is edge foot #10. It seems I use it for a lot of things, not just along the outside edge, but for stitching in the ditch for one. I love to make little cosmetic bags, pencil cases, coupon bags, and even a little first aid kit for a cellist to keep in her cello case (after she needed a bandage at concert). So I adore my Bernina zipper foot. My zippers are perfect! I agree, I LOVE the #10D edgestitch foot. I use it every chance I get and have perfect results each time. I bought the bullet and bought the book when on sale. It is a big help. When they put all the feet on sale at the end of the year, I think the book was too. Check with your shop. I cannot live without my 57d foot. I have the 97d but I still fall back every time to my 57d. Have been using presser foot 97 quite a bit lately. Sure makes those 1/4” seams accurate for the quilting I have been doing lately. It is with no question that the Bernina Walking Foot #50 is hands down my favorite one. I love the versatility in using it on my 880, 350 and 300 machines. When I had a 750QE, it was also great. I have used it in many of my quilting and heirloom projects when I wanted precision accuracy. Not once have I been disappointed with its performance and result. I am new to the BERNINA sewing machine. The walking foot is a dream compared to my old machine. It is wider and easier to use than other models I have tried. I definitely love all my D feet! I use the 1D most. The foot that’s almost always on my machine is the 97D. Gives me that perfect scant 1/4″ seam so accurate I don’t even use the guide! I seem to always have th 1/4” foot on my machine. I’m getting back into patchwork. Or it’s #1. Next on my list is the edge stitch foot. 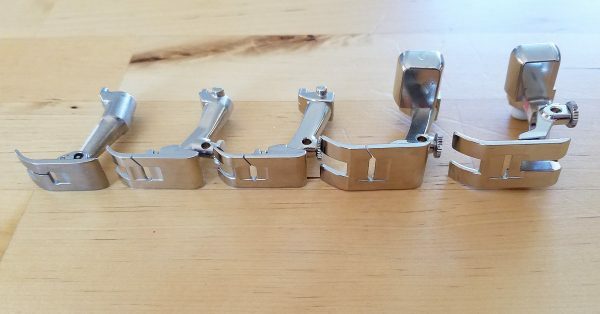 I bought my B770QE eight months ago and have been purchasing quite a lot of presser feet since the machine came out of the box. I have not even had the time to try most of them out yet. The one I seem to use the most is #1D because it is so basic and I think it is beautiful. But, if I had to pick one foot that I like a lot for its specialty it would have to be #50 – the walking foot. Not only is it so different from all the rest, I am mesmerized by it as it walks. I’ve been a sewer of clothes for decades, but I am recently most interested in sewing modern, minimalistic quilts and the walking foot is key to the quilting and that’s how I use it. My favorite is the BSR, I love to do free motion quilting on my Bernina. my favorite foot is the basic 000, I would be lost without it. My fave now is the button foot number 18. I have long been sewing buttons on my old machine by manually dropping the feed dogs, trying my best to place the button in just the right position on zig-zag stitch at the same time holding a pin above the button so the zig zag wasn’t too tight. All this being automatic with a true foot that actually hold the button in place well, already has a shank and a non slip costing to the button doesn’t slide is phenomenal! Thanks Bernina for this revolutionary new foot! It’s so hard to pick a favorite! I have so many, depending on what I’m doing at the time. However, my newest favorite is the #72 ruler foot. That one makes using rulers in quilting *so* easy! Visibility is excellent, with markings both inside and out for easier alignment. Since it’s a standard thickness, it allows the use of a variety of 1/4″ rulers, and it’s such fun to try out different patterns with straight lines or curves. As I told my Bernina dealer, I’m in love! I love my walking foot. I quilt with it and it’s great for sewing with thick seams. My favorite is the new ruler foot. It was expensive, but it’s so much better than the third-party foot I was using. I use #9 the most since I have been embroidering for grandkids and gifts. I love all the features books and hope to win, I would love to learn more. I love the quality of the Bernina machine and feet! My favorite Bernina foot has always been the “Stitch in the Ditch” foot. I LOVE all my Bernina presser feet but I wouldn’t be without #10 the edgestitch foot which I use to topstitch, stitch in the ditch, join 2 pieces of batting together and much much more. #10 gets my vote, too. Very useful! The foot that I use most is the 1D, so I would say it is my favorite. Engaging the dual feed when using decorative stitches helps them to stitch flawlessly. #26 Darning foot is my absolute favorite as of now – I just got my Bernina 770 for Christmas, so I’m just learning about the feet. A book of all of them would be so beneficial! Thanks for the chance to win! My favorite is #37 – the 1/4 inch patchwork foot. Since I began using it my quilt tops look so much nicer! The 1/4 foot #57. I’m a quilter and this is my go-to foot when piecing! As a quilter, my favorite is not one but all the great options for 1/4″ feet. I have had the #37 and #57 for years. Now the #97 is the best of both for 9mm stitch width machines with the seam guide removable. Now the ultimate … the #97D to use with the dual feed engaged. The truly make it easy to get the perfect 1/4″ seam. Favorite foot is the overlock foot. I use it keep edges from fraying. I love every foot that I have tried so far, on my Bernina. Lately, though, I have been using my stitch regulator the most while working on a quilt that is all appliqued and I am sewing around the edges with it. I do want to learn how to quilt with rulers, though. I think it will be fabulous to learn how to do that! I just recently used the 10 Edgestitch and it is quickly becoming my favorite foot. Wish I had used it when I made those 14 potholders! # 57 the 1/4″ quilting foot…the guide line is particularly helpful in sewing the quarter inch piecing seam. Love Love all the feet but I guess my favorite has to be 10D and 97D. Love the guides that come with these and that helps me stay straight. Would love to have this book! I love the #26 Embroidery foot! I have used it to make many, many fun & beautiful projects & gifts. My recent favorite is the Roller Foot. I’ve been recycling a lot of feed sacks into tote bags and it makes the sewing much easier! My favorite foot is the #57. I used it to get a perfect quarter inch seam when I quilted. I got it with my first Bernina 635 and fell in love with it. It made sewing east and foolproof. I love it! Your book looks amazing and so very helpful! My favorite for is the buttonhole foot. It’s the reason I bought my machine. It makes my finished clothes look okay much more professional. I do love the #10 foot too, but I really love the invisible zipper foot. Sure I only use it for one thing, but it does that one thing really really well! Omgosh pick only one fav that’s hard. I do use my 57d the most but also use walking foot and 10d. It really depends on what I’m working on. 37D! I love to use this foot for sewing exact 1/4 inch seams. I use it for quilting as well as for garment construction. It is my “go to” foot! I really like the patchwork foot. It helps keep my seams consistent in quilts. Can you explain why the new B570QE machine comes with the Patchwork #97 foot and not the #97 D foot. Love my walking foot right now, but that BSR, WOW!! #10 foot. I love the guide. It’s so useful for so many projects to get my stitches exactly as I want them! If I didn’t have the #72 ruler foot, walking foot # 50, then my favorite foot would be the 57D patchwork or the #9 darning foot or maybe the…………, obviously, my list could go on and on. 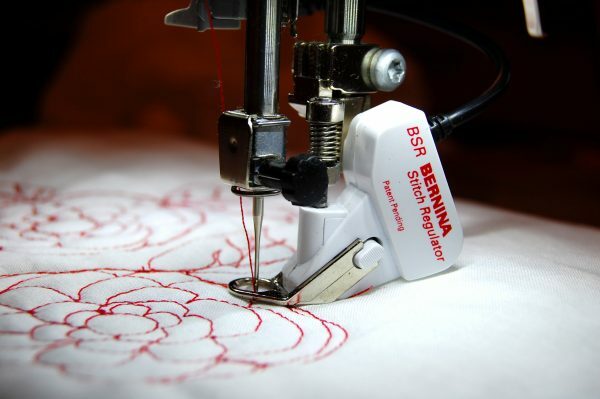 Bernina makes every project possible. The BSR is genius for all of us who want quality workmanship. Thank you for your supreme quality machines and feet! I don’t know how you could only pick one. The possibilities are endless with your support and commitment to those who enjoy sewing! I find my go to foot is 97D for most straight sewing and the 1/4 inch seeing for quilt making . The 10D is wonderful for stitching in the ditch and sewing on the edges. The 71 is wonderful for binding .. I have several others as well love learning different uses for each one . I like using foot #71 for attaching binding. It works great and is so easy to do. Right now my fav foot is #72, which I use with quilting templates. Love it! My most used is #1, so it’s my favorite. The quarter inch and walking feet are close behind. My favorite foot is 97D as most of my sewing is piecing quilts. I love my 97D foot. Accurate 1/4 inch seams make the quilt outcome so much faster and accurate. Number 10 edge stitch is my new favorite for stitch in the ditch. It has improved my quilting. I love my BSR foot and really want to try the new ruler foot. The #72 foot is my absolute favorite! I never thought I would be able to get professional looking quilting. I love showing my quilts and telling people I did it on my Bernina. I love the 23 foot. It makes appliqueing so easy. I love quilt making with my #37 foot. It’s accurate giving me fantastic results. My next favorite is my walking foot. It’s a must with straight line quilting on a quilt sandwich. On my first Bernina, I fell in love with the #6 Embroidery foot. I still love being able to thread a small cord through the foot and zigzag over it for easy gathering. I love all the Bernina specialty feet, but my go-to foot is the #97D. Precise 1/4″ stitch and great feeding with the wider foot. I don’t have a favorite – yet. So far, I’ve been learning to use my Bernina by making over a dozen American Girl Doll outfits for my granddaughter. I learned to sew in high school, but felt that I was fighting my old machine, so I finally bought a Bernina. I’ve just inherited my aunt’s quilting books and some sewing accessories, so I’d love a chance to learn to use different presser feet and sew for myself! The whole reason I got a Bernina was for the BSR! And I was not disappointed. It works like a dream. I haven’t found a foot I didn’t like, but the BSR is my must have! Love my walking foot to make quilts with! I love the foot #37. I spend about 12 hours a day piecing quilts and I couldn’t do it without this foot. My favorite foot is 10 edge stitch. I use it for top stitching, stitching in the ditch. There are many other feet I love also. Couldn’t do without my Bernina. My favorite foot is 26. 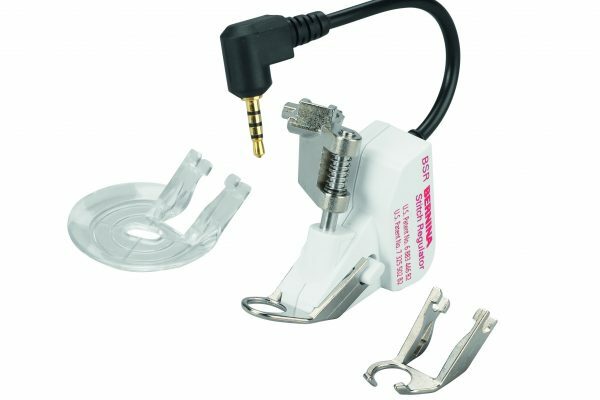 I use it to embroider with the embroidery module. I love it. It’s a toss-up between 10 for stitch-in-the-ditch and 96 for ruler quilting! I love my #57 quarter inch quilt foot. It’s my best friend. I am just learning to use my Bernina even though I have had it several years. My favorite foot is the darning foot. I like playing with it and learning different ways to use it. Although I use #34 for general sewing, I love having a variety of feet for a specific use. I do ALOT of Heirloom sewing and use the patchwork foot (#37) often along with #20, 3A and many others. I have 52 feet plus attachments, assorted plates, and other accessories! Currently I own 4 machines plus a serger. My favorite is #10 (all of them from my 180 onwards) This was the foot that I was told I HAD to have when I bought my first BERNINA- it was free with the purchase. I was never disappointed! Stitch in the ditch, following next to seam lines , folds, attaching lace, heirloom. Most diverse, in my opinion. The darning foot was my first introduction to free motion quilting way back when fmq was a new idea!!! I think I have worn out a couple along the way as this is my favorite way to quilt!!! I also love my Berninas for their awesome stitch quality!!! My favorite presser foot is the quarter inch foot 97. I use it whenever piecing quilts and when sewing binding onto quilts. I use the 1C zigzag foot for almost everything! I like the way it seems to hold the fabric better when I’m sewing purses. My favorite foot is the 97D. It stays on my machine when I am sewing with the smaller seam allowances used in making doll clothing. I have several favorites-I use the #37 foot the most for 1/4” seams when I quilt and the #26 foot for machine embroidery. The pin tuck feet are great for heirloom sewing of which I do a lot for my granddaughters clothes. Sew many feet and sew little time. Thank you BERNINA for the great machines and I would love to learn more uses for all of the feet I have. The darning foot with my 830 record is my favorite foot. I was freestyling embroidery with it long before the fancy embroidery machines were even thought of. I love the 97D for piecing! It is probably my most often used foot, followed by the 20D. I use the 1/4″ foot the most because it helps me get a precise scant quarter inch seam when I am piecing a quilt. As the mother of two boys my favorite foot is the darning foot. I have been able to repair so many clothes. My favorite is the walking foot, because it is so versatile I can leave it on my machine most of the time. I’m currently making Angel gowns from wedding dresses and the walking foot helps to keep the fabric from slipping. My favorite foot is the 10 foot. It’s always the first foot I purchase for a new machine!! Makes your edge stitching look so professional!! I love my 97D foot for all my piecing..it makes the perfect scant 1/4″ seam allowance. I’m new to Bernina, so my favorite presser foot is yet to be determined. I used to sew clothes for my children on an old Sears machine. I am excited to sew clothes for my grand babies on a Bernina! I love how the choices of feet give us so many choices in design. Sometimes it is just a matter of changing the foot to create a whole new look. 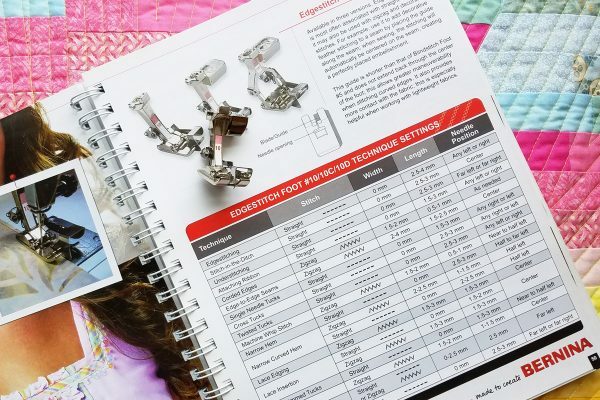 The guide to BERNINA presser feet and accessories book looks like it would be such a valuable tool in picking which foot to use and what accessories you might want. My most favorite foot is #20. There are several others I couldn’t live without. The edge foot, cording foot, Teflon foot, ruler foot, darning foot, zipper foot. I love my Bernina. My Bernina is new and my first to own. I have not had an opportunity to use all the feet but i really like the 20 foot as i enjoy using the many decorative stitches included on my machine. Cant wait to learn more! Right now I am discovering all of the wonderful things you can do with the ruler foot. I finally have straight lines and consistent curves when free motion quilting. My favorite foot is the quarter inch foot (37) for accurate seams when I’m piecing my quilt blocks. It is rarely off my machine unless it’s time for the walking foot or #9 for some free motion quilting. I have just made two exciting purchases that may change this – the first is a brand new 780 with BSR and a ruler foot (72). With Bernina, I know I’ll always be adding to this favorites list. I still love the more commonplace zipper foot #4. It is simple but elegant – a true example of form follows function. It’s perfect for piping and, of course, for zippers! I love the Walking Foot for those modern quilting jobs that need more control than the dual feed can give me. Thanks for the quality products. Just purchased #97D for greater ease in making my 1/4″ seams with the 830. Learning to love my BSR foot! So, my favorite, I do not know yet but probably everything. I just bought my first Berina 350PE last week after 37 yrs. on a Singer. My machine broke right in the middle of a pile of mending. My daughter and I started the Berina Classes last week. Wow, we are so excited with the opportunities this machine will bring us. Glad to share this machine with the next generation! She has a host of ideas that she developed this week alone. This weekend is proclaimed a sewing weekend per her. Sorry, iPhone but mommy and Berina wins! Thank you for opening the door to this new world! Any of the dual feed feet I love on my Bernina 830!!!! I haven’t found a fabric/thread combination from the most delicate lace to the heaviest denims that don’t feed beautifully with these feet! I have to say the 10D is a favorite of mine. Love it for stitching in the ditch, edge stitching and top stitching. However, I have to admit that all of the feet I have are awesome. Love my Bernina. Free motion embroidery foot #24. It’s the foot I learned to free motion quilt with (better visibility than the darning foot). Even though I now have a machine with a BSR, I still quilt using this foot about 80% of the time. How do I choose? It really depends on what I am working on – I mostly piece so I use my quarter inch foot for that. But I also regularly use the zipper foot, zigzag foot and when adding bindings I use the walking foot. Thank you for the chance to win! My favorite at the moment is the Bernina walking foot. I’m currently sewing with through 4 layers of fabric and 2 layers of cotton batting and the walking foot is working like a charm. The description of the feet – amazing! When you go to classes not all of the uses are discussed – the book would be just a blessing. I have my first Bernina and am loving all the new experiences. My favorite is the 1/4″ foot. I never have to measure around quilt pieces when using this. I used it when working on my quilt Lattimer Farms which got 3rd place in it’s category in the Ky State Fair. I was so proud! I need to pay more attention to using specific feet. I am a quilter so I use 97D and the seam guide a lot. I have used the BSR but I would like to become more confident and start to do some of my own quilting . I love the wonderful feet. My first ever Bernina 560…the zipper foot is wondrous! It gets me a perfect zipper every time ! I use the 1C for edge stitching the outside of the zipper for my purses. Thanks Bernina! May favorite foot is the #10 edge foot. I have it for all my Berninas. I can’t imagine sewing without it. Recently purchased the new 590 and although I love my previous Berninas this is by far my favorite. I just bought the ruler foot and rulers and can’t wait to get started using them. What a great innovation. Thanks Bernina for making sewing fun. I’m fairly new to quilting and all these feet fantastic me !! Liking best 10 Edgestitch and #72. I bet I could spend hours and hours looking at the book and learning so much to help me improve my quilting. My favorite foot is the the 34D. It is a clear foot allowing me to see stitches as I see. Plus it connects to dual feed which I love. My “new” favorite Bernina foot is #97D. It allows me to sew patchwork quilt blocks with an accurate 1/4 inch seam allowance. Of course, I love all of my Bernina feet and accessories—each one for its specific task. I can’t really tell y’all what my favorite presser foot is yet because I barely began to start using my machine. It actually sat for almost 1 1/2. I have actually been sewing on it now for about 4 months and have been participating in some of the local Bernina classes. The one presser foot that I have seen in action and currently have in small collection is the Ruffler. If I had to actually choose it would be that one. It is so amazing how it just gathers the fabric for you and moves along so nicely. I can’t wait to use it and learn about many more. Thank you Bernina of Lawton for lighting the fire once again. Love all my Bernina feet but my favorite and most used foot is 1D, reverse pattern foot. Love using it for general sewing and embellishing crazy quilt blocks with the fun built-stitches on my machine! My favorites are either the quarter inch foot (obviously for quilting) and the walking foot. The walking foot is the best to avoid “tucks” in your seams! I love my #57 1/4″ foot with a guide flange for my current machine. Very useful. However, my favorite feet belong to my original 35- year old Nova. The numbers of the feet are engraved into the metal. My favorite foot is 34D. I am a quilter, I hardly use any of the other feet, I need to look up feet to figure out which one I need for other projects. If I have to choose, then my “go to”presser foot is number 20, the open toe foot. I like to see where I’m going! So many choices, and they all do so many different jobs. I am a quilter, so my absolute favorite is the 97D. Previously used the #37 a lot, and still use it for 1/4″ seams in tight spaces. The #20 is a virtual tie. As you can tell, it is almost impossible to pick a favorite, because all Bernina feet are so well engineered. It would be hard to choose. Recently I bought a zip foot for invisible zippers and I am excited to try it. I also like my BSR foot. It sits on the edge of my sewing cabinet and rarely makes it to the rack where I keep my feet. The ruler foot #72 in next on my have to have list.Oh I can’t decide! I have to agree with most of the ladies who responded so far! The edgestitch foot 10C is so versatile and a close second is one of my narrow hem feet, 63 or 66. I love the look of a tiny hem! I love the 97D foot. I quilt everyday and the 97D makes it so much easier with the dual feed. I also use it to actually do the quilting as the dual feed is awesome at feeding the quilt sandwich through the machine without any puckers. The 97D is my go to presser foot. My favorite is 10. I use it for edge stitching and stitch in the ditch. Love my Bernina’s!! My favorite is the all-purpose 1D, but the foot used has to match to job at hand, so the variety is wonderful. I just got a dual feed machine and WOW the new D feet are amazing. I really like the couching foot. I do a lot of embroidery so the 26 foot I use the most as well as the # 1 foot. I agree the 10 foot is amazing. I just used the 97 D to quilt a full size quilt. Wow what a difference it made. For my favorite I would pick the BSR foot. It is just so cool. I would love to have the big book to add ro my library. I bought 1, 2, & 3 But i do not have the big book. Bernina all the way! Currently my favorite foot is #72 as I am learning just how to use it. Also #10 to apply my apply my bindings and keep my stitches looking nice and straight. I’m new to Bernina machines. It’s hard to pick a favorite foot because I’ve done little sewing on my new machine. As of yesterday, the #10 edge foot is my favorite so far. I used it to sew a border on my table runner in a class I took yesterday. My favorite is the 10D. I love it to help me make 1/4 seams, top stitching and stitching in the ditch. It helps me be so much more precise than I would be without it. I am a new “empty nester” with a new Bernina and loving it! I love everything Bernina- I learned to sew on my mom’s Bernina in the 70s! Right now I love my 97D foot for piecing quilts and will soon tackle quilting. I have much to learn about quilting on my home machine. The books would be an awesome addition to my library of quilt books. This article was AMAZING! I never appreciated the “why” of presser foot design and construction of the underneath side! 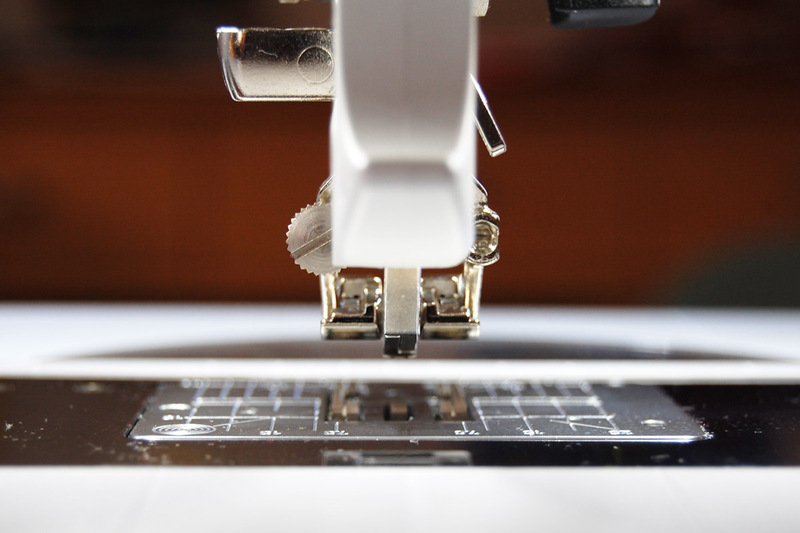 As users, we only notice the features on top that we can see working to make our sewing tasks easier. I would love to be able to read more about all the design characteristics of the various feet. I do mostly quilt crafting types of sewing… piecework etc. I often gravitate to the “0” foot for many tasks because the results are usually just fine if I keep my attention on my work and don’t go too fast! 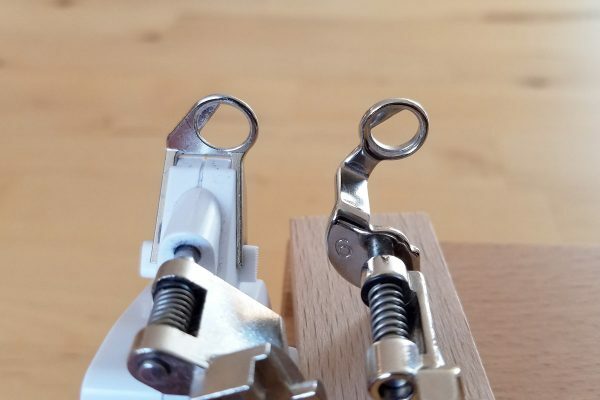 I have a number of presser feet and will pay much closer attention to the real differences between them as I approach my sewing challenges going forward. That said, I’ve been using the #5 foot on my 1130 to help guide me doing stitch in the ditch but am going to begin a hunt for the #10 based on the comments in this blog piece. I really would LOVE to have the book. I am learning more and more that “having the right tool for the right job” makes everything easier! My favorite foot is the walking foot. I love how it keeps my fabric layers together as they move through the feed dogs, resulting in my seam lines and fabric patterns aligning perfectly! It is hard to decide which foot is my favorite. I guess my favorite is the one I need for the task at hand. Love my Bernina! Foot #20 is my all time favorite. I am a quilter and adjust my needle to the right to stitch a perfect 1/4″ seam, great visibility doing machine applique with satin or buttonhole stitch. I make a lot of miniatures and this foot allows good viewing of the small pieces and especially need this foot when paper piecing. I have worn the finish off the bottom as I have used it so much so it is time for a new one! I love my stitch regulator! I don’t quilt my mini quilts without it. My favorite foot is the zipper foot. 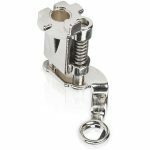 The Bernina zipper foot is easier to use, sews a better looking zipper. as compared to another zipper foot for a different machine. I love my #37-I love to make quilts!!!!!!!!! My favorite foot is 10 edgefoot. I love my straight topstitching, stitching in the ditch, and decorative stitching. The feet book looks amazing and would love a copy. Love the new foot #72 for the free motion ruler work. Ever since I purchased my Bernina 830LE with the embroidery module, I love the 1C reverse pattern foot! I have grandchildren and I love embellishing and embroidering with my Bernina. I love her so much I call her by the name “Blaise.” When I was riding in the car, on the way home from purchasing my Bernina, I was reading the booklet from the Bernina Dealer, and it stated, “this machine has blazing speed”, and thus was born my nickname for her. I sew every single day, and usually I get up 30 minutes early, just so I can sew. This book would be a nice addition to my sewing room. Thanks for having this contest. The BSR is my favorite at this moment. I do my own machine quilting so I love the perfect little stitches it makes. I have two favorite feet, the #37 quarter inch foot and the #20 open toe foot. I couldn’t piece quilts or applique without these two feet in my tool box. I love the #20 foot for embroidery stitches also. I just got my Bernina 770QE last year so I have not acquired a lot of feet yet, but my favorite foot so far is #37D…it has helped make my quilt piecing so much easier and more accurate. My very favorite and most used foot is 97D. I love how I get accurate 1/4 seams on all my quilting blocks! My current favorite foot is the 39C embroidery foot. I use it for applique and embroidery. Learning to use the 72 ruler foot. The 97D foot on my Bernina 770QE is my go to foot for piecing my quilt projects. Accuracy beyond compare. I love all of my Bernina feet. My used 1230…. my used almost daily machine… came with a bunch of feet…. most I don’t know what their use is. Lately, I’ve used #5 A LOT! (Still haven’t figured out how it differs from #10)… I use 37 a lot, and 0, 1, and 4. This book is now on my radar. It would be like a Bernina class for my feet…. I agree with some of the above comments. I could not get by without my edge stitch foot, 10D. It is always laying next to my machine. If I could only have one extra foot it would be this foot. My favorite is #10D, which I use to produce a straight edge stitch. Also use it for stitch-in-the-ditch. My favorite foot is Foot #97D. It really holds the fabric well while stitching a straight line, it is easy to see the 1/4″ seam and it is very versatile! My favorite foot is number 37, I piece a lot and the quarter inch foot makes it a breeze. Love, love, love the invisible zipper foot for perfect insertion every time! Currently it is the 97D foot, but not necessarily for patchwork. I do a lot of small clothing and other projects with 1/4 inch seams. On my 9 mm machine, it really works great. My go to foot is #56 the non-stick open toe. I use it for almost everything when at a class or at home and don’t want to search through my tackle boxes of feet. It works beautifully while appliqueing several layers so the stitches remain uniform instead of bunching because the foot gets stuck on the edges. I purchased the original three volume feetures books several years ago when I purchased my B380. Go to them all the time. I upgraded to the Big Foot Book when it became available — would love another copy to keep with my B830. Did I mention I think I own most of the feet for the 380? Now to see what the 9mm feet will do! I have the “Big Book of Feet” but still use the internet especially for ideas on other uses for the various feet. Favorites are 10, 37 and 3. The Buttonhole foot is magical! I have the ruffler and a super fun foot to use as well! I love my 10D edge stitcher. I love it for keeping me on the straight and narrow! My favorite foot is the 10, 10C and 10D edgestitch. I have all three for my current machines as well as the “old style.” I use them for all my edgestitching on garments and accessories. When possible, i use them for topstitching as well. My favorite foot is 34D. I really leave it on the machine all the time. It has clear visibility and helps hold down whatever I am sewing. My favorite foot is the 10 and 10D. Followed closely by the 97 foot. I used the 10D for clean neat sewing on edges of purse straps, tops of purses, in the ditch and all kinds of different uses. I quilt and I love the 97 foot. Used to use the 37 but now the 97. Thank y’all for all the wonderful feet ! I am blessed to have small boxes of feet! I often use foot #20. It gives great visibility and firm pressure at the same time. My favorite foot is the #57D for piecing quilts. The #20D is a 2nd favorite for walking foot quilting. I would like to invest in the ruler foot for FMQ and a #10 for stitching in the ditch. Hello! 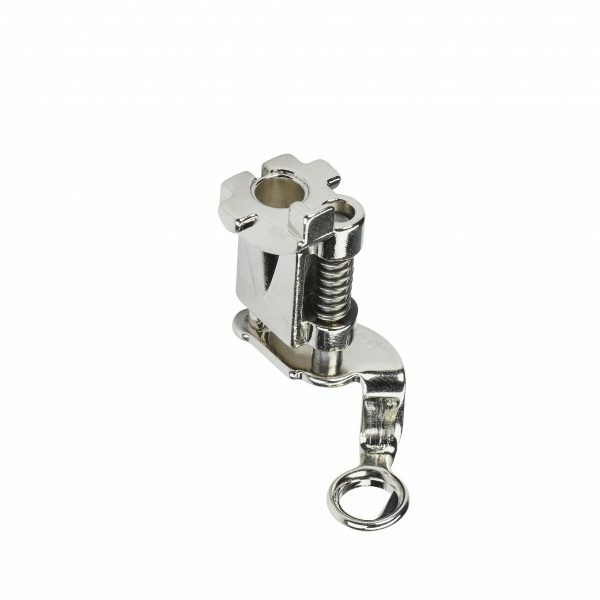 My favorite presser foot is the 10D Edgestitch which I use with my 750QE. What do I use the 10D for? The possibilities are endless. Obviously it makes the perfect, straight edge stitching line on garments. It also works great for ‘in the ditch’ sewing on quilts. I love using it to sew down the linings on armholes, and the tops of purses. I learned about this stitch in a Bernina mastery class and immediately made the purchase. 🙂 I use it constantly. My favorite foot is the one I am using at the moment. Right now I am doing a lot of embroidery. I like being able to incorporate machine embroidery with quilting. I am looking to expand my options with trying some ruler work, so #72 is on my want list. My favorite presser foot is actually the Bernina Stitch Regulator (BSR). I bought my 770QE last year and I can’t get over how evenly my seams comes out! I buy more feet all the time and this book will be very helpful. So hard to choose my favorite foot, but I would say I use the open toe a lot. I love that I can see what I am doing and my creativity is coming out correctly. I would love to see the possibilities available to me with all the feet in the book! I seem to use number 36, the patchwork foot with the single hole throat plate most. I’m just learning to quilt and love all my Bernina toys! My favorite has always been #10 and is now 10D. I rarely make anything where I have not used this foot in some capacity: edge stitching, stitch in the ditch to attach a facing or for quilting, top stitching, multiple rows of top stitching using the needle positions, machine quilt binding, and edge joining. Love it! I am really enjoying using the new Ruler Foot #72. I need lots of practice, but with the rulers it is giving me control over my quilting designs. My favorite foot right now would have to be the ¼ inch piecing foot, #37. I’ve been making a quantity of half square triangles and I find the #37 to be invaluable. Love my Bernina…specific feet for the job make projects so much easier to complete. My favorite foot is the 57D for piecing quilts because it makes that quarter inch seam easier to do. On the other hand, I use many different feet depending on the sewing I need to do. My favorite Bernina foot is the Reverse pattern foot #1D because it can handle any straight stitch sewing that I need, forward and backward stitching and even quilt piecing. I make a lot of quilts and love my Bernina 830 LE Sewing and Embroidery Machine! My favorite foot since purchasing my 530 Bernina is the walking foot. This foot has changed how I sew. I have less frustration and more enjoyment when I see even when I am sewing straight seams. Thank you for the opportunity to enter this sweepstakes. I wish I had purchased a Bernina when I started sewing in the mid 70’s . My favorite foot is #37 the quarter inch foot. I use it for all of my piecing. My favorite foot is 29 Quilting Foot. I enjoy doing freehand sewing and this clear foot gives a clear view of every stitch. Thank you for giving us the opportunity to win the foot book. I keep printed papers of my foot collection and a book would make the information so much more accessible! My favorite is the edge stitch. Keeps everything so perfect aligned as I stitch. I love my 3A, the automatic buttonhole foot. Makes it so much simpler to keep the sizes the same when I am making multiple buttonholes. I have been doing a lot of mending and hemming so right now good old trusty number 1 is my favorite. I love by BSR foot. I use it for quilting and I am as happy as I can be ! It depends what I’m doing. I love my 57foot since it makes so easy to do 1/4” seams! I also like #10 foot and, of course, walking foot. Choosing just one Bernina presser foot is like choosing a favorite child, out of all you’re children. But right now, I’m loving the Stitch-in-the-Ditch presser foot with Walking Foot feature. Traditional quilting on flannel quilts is a real breeze. My favorite is my 97D for piecing work. Also use it for making quick pillowcases. I have two Berninas…a 930 Record electronic and. B 380. I pretty much use the walking foot all the time on both, where was the walking foot back when I was matching plaids on wool skirts? Also, love the #10 foot for edge stitching and stitch in the ditch! Love my Berninas and their precision! and would put this book to good use! I love my 97D. I can see quarter in seams, I can edge stitch. I use it all the time. I love my #10/10D Edgestitch Foot! I use it constantly for heirloom sewing details, for topstitching and under stitching, and grab it whenever I want to be sure things are all nicely lined up and my stitching perfect! It’s my favorite! My favorite foot is the BSR. When I saw this foot on a Fons and Porter quilting show I knew I had to have it. I ordered the Aurora Q440 before it was even in the store. I had to wait several months to get it, but it was certainly worth it. Reading these comments makes me want to get ALL THE FEET!! The one I use all the time is #16 gathering foot. Simpler and easier than a ruffler foot, it makes ruffles so simple. Could not live without it! I love all of Bernina’s products but my favorite foot is a tie between the 1/4 inch foot and the edge stitch foot. I use them for so many different things. I live in a small town and would make good use of the big foot book as a reference book. Thanks for offering us this opportunity. I used to dearly love my #37 patchwork foot, but now the dear thing gathers dust while I sew merrily using the #97D. After all my flawless piecing thanks to this little masterpiece, I switch over to my BSR and go to town free-motion quilting. Best of both worlds! I need to note I have 3 Bernina cabinets full of Bernina feet, so that book would be a big help with figuring out what some of them do! I love the 97D foot! It has greatly improved the accuracy of my piecing when making quilts, and who wouldn’t want that? Currently my favorite one is 72 but I don’t own it yet. I change depending on which one is new for me. I have enjoyed ever one of them that I have and used so far. Love all the D Feet for the dual feed, especially love the 97D. It is hard to pick one favorite foot. I use quite a few of them but I use my 1/4 inch foot the most. I do lots of quilting and this foot helps so much with keeping my seam allowances the correct size. My favorite foot is the #10 foot. I use it for edgestitching, stitching in the ditch and attaching trims, etc. I have been adding about 1 or 2 feet every year. Love having the specialty feet. I’m hoping Bernina makes a ruler work attachment for BSR. I bought my Bernina Record 830 many, many years ago and sewed alot of my daughters clothes. I put the 000 foot on and have only taken it off once and then promptly put it back on. I am planning to do some quilting in the near future so I will be trying another foot soon! Oh by the way. . .my Bernina may be an old one but she is a keeper! I bought my Bernina Record 830 many, many years ago and sewed alot of my daughters clothes. I put the 000 foot on and have only taken it off once and then promptly put it back on. I am planning to do some quilting in the near future so I will be trying another foot soon! Oh by the way. . .my Bernina may be an old one but she is a keeper! I think if I knew more about all of the feet I may try more of them! #1 is used the most for general sewing. I have used the darning foot (#9) for some free motion quilting. I would think my most used foot is a favorite! 1, 1C, !D. I have the originals with the 1970’s on that came with my 830 on to the others with my 530 and 750. Very veritile. The next is the 37, 37D and 97D with the straight stitch sole plate! It is so nice to have options! My favorite presser foot is the #10. The projects I make are garmets and this foot has many uses for my garmets as a sewist: topstitch, stitch in the ditch and embellishment attachment. I now know the difference between the #5 and #10 feet. Since my first Bernina in 2004, all sewing machines have the needle movement ability where the #10 foot works perfectly! Thank you Bernina Creates. My favorite is the Edge Stitch foot. I love seeing my top stitching or edge stitching look perfect. This foot makes it so easy to do. As a quilter, I use the 37 and 97D feet the most, but I also HAVE to have the 10 foot for each machine. I use the 10 to edge stitch consistently on all kinds of projects, including topstitching for bags. All Bernina feet are great! #97 for 1/4” seams when piecing, piecing, piecing. This would be a great reference to win. I have to say I use my walking foot the most but find them all to be a great sewing asset. Oh my, what a difficult question, my favorite presser foot! I think it would be a toss up between the 57 and the walking foot! It really depends on the project at hand. Who could do without the button foot, the zipper foot, and the gathering foot? I could go on and on, and I am sure if I had the Presser Foot book to introduce me to all the feet and there capabilities I would purchase and be using more. 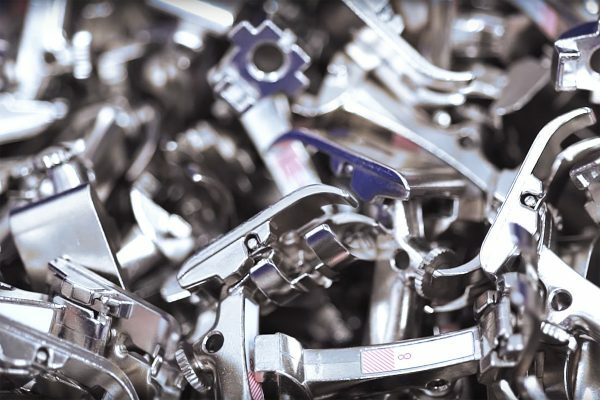 Thank you Bernini for the large variety of presser feet! I love the ruler work foot #72. It has given me the courage to try free motion quilting again. I love all of the Bernina feet! My favorites are the #52 foot for garment sewing and the #37 1/4 inch foot for quilting. I love the precision the special feet provide. So hard to pick just one! Just got my Bernina 6 months again and I’ve already filled my box full of feet but the one I use most is 34d. I love the clear sole and red markings for precise guidelines. The foot I reach for most often is #10, the Edgestitch foot. Honestly, I use every foot I have and love them all! Since I got my 765SE (her name is Rosey Girl or RG for short) my favorite foot is 97D. Love the duel feed. The BSR is amazing though for quilting. When I used my 730 exclusively my go to foot was 57. Now that I have the choice between machines I use which ever one is the best for the current project. I have to saw, though, that I would love to win this book so I can have all this information at my fingertips since I don’t have a computer in my sewing room. My favorite foot is the 37, the 1/4 inch piecing foot. Accuracy is important in quilting, and this foot helps me get it right. I have the old style feet and have always been fascinated how they are made and the amazing things they help me do. I like the blind hem foot #016 because when my kids were little, I hemmed so many little dresses so fast with it. It’s been great anytime I need to run along an edge. I would have to say that my favorite presser foot has to be the walking foot (unless I am piecing something then it is #97 so tricky question). I love the 10c edgestitch foot. I make a lot of bags that require edgestitching – and this foot ensures an evenly sew one. Thanks! My favorite foot is #37, the 1/4″ foot with the guide, great for piecing quilts! I love them all; favorite? 10D I love it for top-stitching, making this for my one-year old granddaughter. I thank you for the opportunity to win the book! I do alterations and use #5 all the time for hemming. It’s a time saver and creates a lovely, professional finish. Not sure if I would call it my favorite foot, but the #37 1/4″ for is certainly what I use the most! I love this for for piecing! I use my 1C and 57 the most. I do seem to change my presser feet often when sewing. I haven’t found one I don’t like, but I haven’t had a chance to try them all. I love the Bernina walking foot #50. I sew a lot with minky and it works like a dream on those fabrics. The #1 all purpose foot meets my needs most of the time. However, when I quilt or do creative work, I use my entire arsenal. Don’t have many feet yet, but I want to add more. Love your tutorials. My favorite foot is my walking foot. ; I love the way it holds my fabric in place no matter what I am working on. This week my favorite is the New #72 Ruler foot, I’m addicted to quilting with this foot not only because I can quit against rulers but I love that it’s height adjustable. The right foot on your machine makes creating much easier and great finished item no matter what you’re sewing feet do make a difference. I am new to Bernina and am thrilled to use my 1/4 inch foot …. for now, as it’s been less than a month and I traveled for 2 weeks of that! . I’ve loved the comments about people’s preferences and liken feet to words. If there is a more perfect one that would be more precise, I would rather use it. I am looking forward to trying the ruler foot so it will probably help me venture in to free motion quilting. Would love to win this book!!!!! My favorite foot is #37D, the 1/4″ foot with the guide, great for piecing! I have the best machine in the world. I hope to have all the feet that goes to my machine. But 57 D is my friend. I am a quilter. How do you pick just one? I have used #4, zipper, and #5, blind stitch, so much that the numbers are wearing off. I also really like #1C and #20. #3C and its companion 18 are great for buttonholes and buttons. So those are my favorites. I love learning about the history of the feet. Looking forward to clicking on the links to update my machine quilting. Too many to pick just one – I usually have either 34C, 97D, or the walking foot on my machine. As so many others have stated it is hard to choose just one. So am going to say the 99 foot because it has so many happy memories attached to it. This is the foot with the finger guard. I used to put my children on my lap and let them sew pajamas for themselves. The 99 foot made me more confident that they would not sew over their fingers. My favorite is 97D, it makes my piecing as easy as pie! Foot #37 is my go to pressure foot as I use mostly my Bernina for quilt piecing. I just got my B 770 QE and I’m having so much fun trying out the different feet it came with! So far, my favorite is the #97 D foot, because it’s been a snap to get a perfect scant 1/4″ seam with piecing my first quilt on this machine. After trying the #10 D edge stitching foot at the sewing class I went to, at my Bernina dealer, I had to buy it too, because it’s going to be perfect for stitching in the ditch. I would love to win!! My favorite is Edgestitch #10. I have used it on makeup bags and on walker bags to give to friends. I have received compliments on how nice the stitching is when I use that foot. I always say that when you have the right foot for the task it makes sewing easier and more fun and makes the project look more professional. 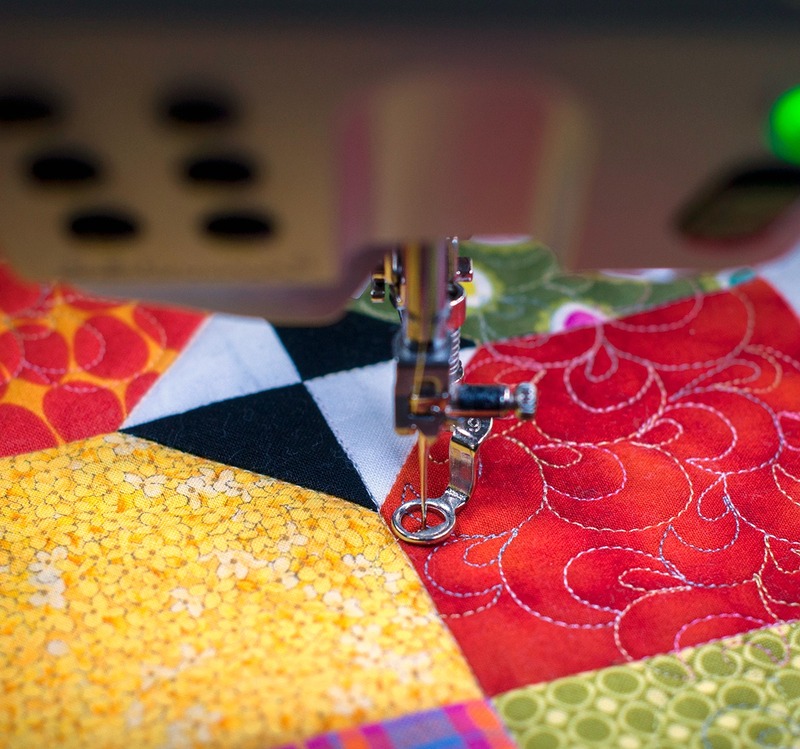 I love my 97D foot – it makes piecing my quilts a breeze. I don’t use the guide, and my seam allowance is always perfect! My second favorite is the newly purchased foot #24 – freehand embroidery foot. Until I get more practice with the BSR, this is my go-to foot for free motion quilting. Would love, love to win The Big Book of Feet! I really like the #97D foot. I do a lot of quilting and this foot allows me to consistently sew my 1/4″ seams STRAIGHT and I don’t have to worry about wiggly seams or fabric pulling into the feed dogs any more.!!!! I love the 97D Patchwork foot!! I like it because it makes my piecing so consistent!!! Also like the 10D edge stitch foot for stitch in the ditch! My favorite foot is the BSR # 42 for free motion quilting. I love the darning foot. I use it in my free motion quilting on my 1130 which I got in 1983. I second the comments about the edgestitch foot #10, but I consider the #55 leather foot my “rescue” foot. Due to its unique design, it allows an unimpeded view of the work area and allows you to place a stitch exactly where you want it. It gotten me through many a challenge. It’s great when you are repairing ready-to-wear’s tiny seam allowances because it grips and feeds so well. It is my go-to foot in a tight spot where there just isn’t any room for a foot or there is an unavoidable bulky seam allowance to deal with. I’ve even used it to make a manual buttonhole beside a seam allowance on a jean waistband. #55 should come with a cape – it’s a superhero! My favorite is the BSR. Accurate stitches every time and expecially helpful to new quilters. I love the BSR to do thread painting on fabric! My favorite foot for my 1630 is the number 18 foot to sew on buttons. My favorite is the 10D. I use it for edge stitching and also for stitching in the ditch. If asked by a new Bernina owner I tell them it is a must have. I love them all so much but the one I have the most fun with is the darning foot. I used a #34 for piecing and seams. When I got my 790, I ordered a #34D and I love it too. Although, there are projects that when I’m finished, I may have 4 or 5 sitting by the machine. I change feet for different tasks. I have so many to choose from because they all do specific jobs for me! My favorite “go to” foot is the 34D. I love its clear foot with markings with dual feed capabilities that I use everyday I sew. If I could only take one foot out of my box, I’d pick this one. My all time favorite foot is the #10 edge stitch foot. I use for edge stitching around collars and other items. My favorite is for the use on the edge of zippers. It makes them lie nice and flat. And always straight, too, unless the operator wanders off the fabric. Has to be my #37 foot. As a quilter the 1/4 inch foot is on my machine more than any other. I love my walking foot as well as my 1/4″ foot but recently I love my open toed embroidery foot as I have been doing a lot of applique. My favorite is the walking foot. I use it for almost all my sewing to help everything to feed evenly. It works great! I am definitely interested in purchasing the new adjustable ruler foot #72 foot for quilting around templates. I’m happy to see Bernina has provided this. I don’t know how you can have a favorite Bernina foot. They all do their respective jobs so well. I love foot 18. I use it for things other than sewing on buttons. There is no generic foot that can replace it. I like the #37 and the walking foot. I should get hooked onto others but have not. The 52D is now my go to foot. The teflon coating glides over everything – just love it!!! I love foot 26 the embroidery foot. I have 2 880’s and I do embroidery on them. Have started to branch out and would love to have the book on feet. This way I can know what each foot could do. Have started buying feet to try and learn what they do, but it is hard to know what they do and which ones to try. I drive 3 hours each way to my Bernina Dealer. So I do alot of trying and experimenting on my own. P.S. wish there was a closer Bernina 880 Dealer just if nothing else but for classes. Love my machines. If you don’t win is there a way to buy the book? I use the 34D foot for piecing. I click 4 clicks to the right to get a perfect 1/4 inch stitch with the edge of the foot. I like being able to see through the foot while piecing. I use the #9 foot for free motion work. I have a longarm so quilting for me is easier on the longarm. But, for thread painting the #9 works for me. Since I use and enjoy every one of the feet that I have, it’s so difficult to choose just one favorite! However, since I cut and sew lots of little stuffed animals to be given to children in the hospital’s emergency room or by EMT personnel, and I need to sew accurately on the traced line, I probably use #23 (the clear embroidery foot) or #20 (the open toe embroidery foot) more than any others. Love my new-ish Bernina 740. My favorite presser foot is the Patchwork foot #97D for piecing consistently. My favorite is 34D. Clear to see where I’m sewing. I love the #57 foot with the flange to keep my 1/4 inch seams perfect! I came late to the quilting game but am making up for it now and always have a quilt going on my sewing machine. I mostly make quilts for charity and when I quilt with others, I have no worries that my 1/4 inch seams will be the best! My favorite today is the BSR because I am quilting. When I am hemming jeans, my favorite is #8. When I need to sew on a button, I love #18. I love to hem prom dresses with #63 because I can do such a beautiful narrow hem. The truth is, my favorite is the one I am using at that particular time. I am never disappointed or frustrated with Bernina feet! Tailor Tack Foot #7 introduced me to the world of what sewing machine feet can do. Up until we met, all I knew was straight and zig zag stitching. I use this foot to make tiny fringe on antique doll clothing and on the edge of doll house size “oriental” rugs. 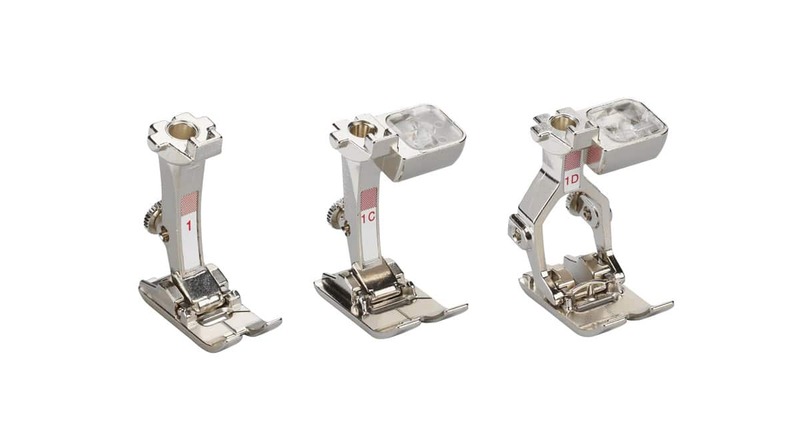 I also love all my Bernina feet, but lately I have been using the 10D foot frequently! Each foot makes one task or another easier or more accurate. My favorite foot is the #37. I am a quilter and the 1/4 inch seam is so very important. I also like the #10 foot for edge stitching. My favorite presser foot in the WHOLE world is #37. The quarter inch foot is a life saver when I am piecing quilt blocks. I love, Love, LoVe, LOVE this foot. I absolutely love the D feet! Was delighted to have dual feed on my 830. The 57D is usually on my machine, l always get the true seams needed for exactly matching quilt elements, sharp points stay true & curves don’t waver, blocks go together matching beautifully. I like both the darning foot for free motion quilting and the walking foot is one I have just started using for putting together layers. I have a 930 abd a 180E and wish there was a bsr foot for one of them. My favorite is the 1/4 inch foot. I love it for quilting but use it for a lot of other sewing projects. I’m pretty new to quilting so I’ve found my go to foot right now is the 1/4 foot for piecing. Next I will becoming friends with the ruler foot. I think the foot and rulers will give me the confidence I need to do the quilting on my pieces. My favorite foot today is the #10 I use it to sew fabric covered clothes line to make coasters and bowls. I love the #72 ruler work foot and am so excited to get better with my ruler work skills. I also love the BSR stitch regulator that I can use with other feet. It improves the look of my stitches. I just love my Bernina 770 QE and the embroidery unit also! My favorite depends on what I’m doing. For piecing it would be 57 so my 1/4” seams are accurate. For attaching my binding to my quilts I use #20 because I use a decorative stitch. I love all my different feet. My one foot that I could not live without every again in the quarter-inch (#57) foot. It makes quilting so much easier. #37 or #97D patchwork foot depending on which machine I’m using. I also use them in bag making as you can top stitch an 8th of an inch from an edge as well as the quarter inch seams. Depending on the pattern I’ve also used the #37 to sew in the zipper. The foot I use the most is the #37. That may change, as I just bought a B570 and a #97D foot, so that will probably become my favorite. My favorite Bernina foot is # 10 because it allows me to finish seams that need top stitching so perfectly. I’m expecting #72D to be my favorite. I’m just learning ruler work and am fascinated with the results. I can see it can save me money for items to be quilted. My favorite foot is the #37 (1/4 inch). I use it for all my quilts. Next I like the #10 edge stitch. Wish I had a Bernina model that could use the BSR . . . maybe someday. I love the 37D foot for making a perfect 1/4 inch seam when I am piecing my quilts. My go-to foot is the 1D – I use it for all-purpose garment and home-dec sewing. When piecing my quilts, I love the 37 foot. I have far too many favorites! I use the #57 & 97D feet regularly for consistent 1/4 inch seams in piecing quilts depending on which machine I’m using. My new favorite is the ruler foot & I’m still learning & playing. The walking foot for quilting but on the other hand I love the BSR for the same. I also love being able to use the same feet on both my 440 & 790 Plus! Next purchase is the #55 leather foot. Walking foot is my favorite. Adjustable ruler foot will be my next purchase. That will open a new field of quilting for me. Might get an overlocker foot, too, so I don’t have to set up my serger to finish a seam edge on a small project. My favorite foot is the 1D. I use it for a whole bunch of things, but first and foremost is stitching in the ditch. By adjusting the needle position to where one fork ride on the top the needle goes right in the ditch. I have more control and better visibility than with the ditch foot. My second favorite is the 97D. I have owned a Bernina just two years and I’m really enjoying it along with all of the feet I have acquired. I think the #20 is the one I enjoy the most. I am new to applique, and it is great to be able to see my stitching. My walking foot is by far my favorite foo to use on my 440 QE. I use it on garment sewing and quilting, actually anytime my seam is longer than 2 or 3 inches. This presser foot really helps both fabrics (top and bottom) slide under the foot at the same rate, no more having one fabric seem longer than the other! I have many Bernina feet and have researched many ways to use them, I keep all this information in my notebook. None of my feet have been a waste of time or money, I use them all frequently! I love the Ruler Foot #72 for doing ruler work on quilts with my Q24. Just started sewing; treated myself to a Bernina 350. The walking foot is my favorite so far. Working on my first quilt and everything stays together so nicely. Since I spend almost all my time embroidering, my favorite foot is obviously #26! I’m a quilter, so the #37 ¼” foot gets the most use at my house. I also use the #57, with the edge guide, but the #37 allows me to sew a ¼” seam from either side of the presser foot –which, for some reason I can’t recall at present, comes in quite handy from time to time! My favorite foot is the #72 rulerwork foot. 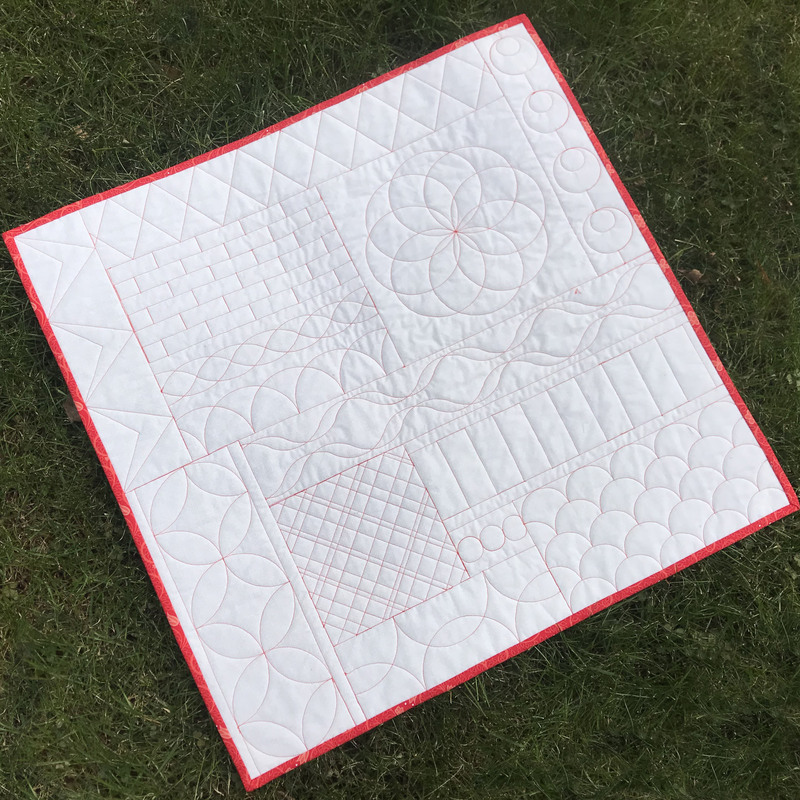 I have been working on Amanda Murphy’s rulerwork quilt along tutorial and am very excited that I now will be able to quilt my own quilts. And it is so much fun! I have to pick one?! 😉 I use my #37 1/4″ foot and my #10 edge stitch foot constantly. Such time savers! 34D is my favorite foot. I like that I can see where I am stitching. There is not a foot that I don’t like, but the 37D is one of my favorites for piecing for quilts. Thanks Bernina for making a world of happy, satisfied sewers! My favorite foot is the 97D foot. I love the wider left edge and how it holds the fabric in place. I use it for piecing quilts and just about everything else. I love the #10 foot. It allows me to do perfect top stitching close to the edges of projects. Bernina feet are so exacting and make my sewing look professional! My favorite presser foot is the one that I am using at the time! Really, it’s like trying to choose a favorite child! So, if I were pressed to choose (pun intended), it would be the ruler foot 72. I have finally conquered quilting ruler work on my DSM! I will admit to a learning curve, but I am able to fine tune the height of the ruler foot to obtain perfect stitches in any direction! This just opened se many different beautiful designs for me! I have had my Bernina 750QE for 4 years. I use it daily. I sew garments, crafts, upholstery, and quilts. My machine handles all of it with grace, finesse, & precision! I love the Adjustable Ruler work foot number 72! I’m just learning to use rulers and it’s such fun to quilt my own tops! I love the walking foot- for quilting, the edgestitch ft- to topstitch beautifully, and the blind hem ft to hem to hem pants and all edges on curtains. My favorite foot is foot # 10 – Edge-stitch – 10, 10C and 10D — whichever works best for the current project and machine. I use it whenever I want to stitch following a specific line or seam with a great deal of accuracy. It’s awesome. LOVED this article on feet. My favorites are the 97 D for piecing and my absolute favorite and the reason I always wanted a Bernina, the BSR! I hope, sometime in the near future, there is a snap on foot that allows the BSR to be used for ruler work. WISH wish WiSh! Right now I am trying to improve my machine quilting and I am enjoying using the new #72 ruler foot. My favorite foot has got to be #10 Edgestitch foot. It would almost be easier to list what I don’t use this foot for, I use it so much! It is fabulous for so many thing from perfectly positioned understitching to the prettiest top stitching to perfectly spaced double rows of edge stitches to finishing off quarter inch hems. I love that I can get right up close to the edge of fold on the fabric. The foot I use the most is the 34D. But a recent favorite is the 38. Great for uneven surfaces, like attaching or topstitching straps or thick trims or binding. My favorite foot is #8D. I use this foot when making purses. It is sturdy and I use the single hole plate with it. I can also use the duel feed. As the seam allowance I use is 1/2”, find this foot offeres the most stability my the stitching. Has to be either 37 or 37D. Keeps my seams straight, and when using the uncoded foot, I am able to do a 0.7mm zig zag for machine applique. I own lots of feet and use them all. So well made. I love the walking foot! I use it for sewing quilts together as well as other projects. I love the freemotion embroidery foot #24 foot because is gives a clear view when doing free motion stitching on both my Bernina 790 and my Q20. GREAT for both quilting and free motion embroidery! The #5 foot is the best for blind hemming and more–even edge stitching, applying bias tape, narrow hems, trim application and more. At the moment my favorite foot is the darning. I can move anywhere I want with it and that makes free motion quilting so much easier. Of course in reality, my favorite foot would be the one needed to sew what I am currently working on. My favorite foot is # 37-the quarter inch Patchwork foot as I use it for quilting. Takes the guess work out of it. I haven’t used many presser feet as I’m a new Bernina owner, but my favorite so far is the patchwork #97D. My favorite foot is the 57. When I use it I am assured a quarter inch seam. I have gotten into fiber art and love using the darning foot for the details for my fabrics. I am in love with sewing and truly enjoy creating works of art with my Bernina machines. I also use the free motion foot and get fantastic results. Thanks for the site and all of the information! I love it!!! I like the 34D foot the best. I use it for most of my sewing needs and I can see what I am doing. It works great to add a binding to a quilt. My favorite foot is the walking foot! So many different uses and has saved my sanity many times when working with velvets and other napped, difficult fabrics, in addition to quilting and attaching binding. Like so many of the others, my favorite is varies depending on what I’m doing. My family members are all short so I most frequently grab the #5 foot for blind hemming. I also love the #10 (my “magic” foot — the first add-on purchase after buying my 770QE, my 2nd Bernina), the BSR, the #97D for quilt piecing, and recently got a #72 for free motion quilting with rulers (still practicing). I used my walking foot a lot on my most recent finished project, a bath robe made with a slippery fabric — I can never find one in ready-to-wear that’s the right length for me. I also used my embroidery module and #26 foot to decorate the pockets and lapels with floral designs. I just love the versatility & quality that Bernina offers and the great classes and support that my dealer provides. All the feet are so much fun! My favorite foot is #01 – or any other foot that I can attach a finger guard to. So I can sew with my 7-year-old granddaughter and be sure her little fingers will be protected. All I can say is that, I’m in love with my machine and in love with sewing! design and function and advanced techniques , my sewing improved a 100 gold. Nothing matvhes the design and stability of Bernina feet. Could never use another make of msvhine , purely because of the feet and of cuurse, the knee lifter ! I just purchased a 750 and my favorite is the 1Oc so far. I have a few other few but not sure what to use them with. I keep trying the Bernina website and go from there. This is so exciting I hope I have a written manual to win for the ease of side by side instruments information. My favorite foot is the 97 for my B790 or the 37 for my B350. I quilt a lot and these feet make my 1/4″ seams perfect! I love my Berninas! As strange as this may sound…it’s the one I don’t have. Every year, I purchase a couple new feet. I’m obsessive with new stuff; what can I do, what I try, what other things can I use the new foot for, is it available for both machines (350 and 790). And how did I live without it before? Sew…my favorite foot is the next one…so many things I don’t know, yet! All the D feet!!! I’m especially in love with the 97D…so easy to get my scant ¼ “ seam. That said…the best thing about Bernina feet is the one piece construction…no screwdriver to mess with and it’s solid! 10D is my favorite…edging and topstitching and is great for stitch in the ditch! My favorite foot is the 2A. I love getting a smooth and even finish around fabric edges without rolling or pinching. I use it to finish all fabric edges when I’m making garments. The 34D Reverse Pattern with Clear Sole. The visibility along with the easy dual feed attachment make it my go to foot! Hard to choose one I use the most but the #1C I use quite frequently. As I was born short I use the #8 jeans foot to hem all my jeans. In reading the posts it looks as though I may be buying a 97D for my Artista 640. Thanks Bernina for making great machines. 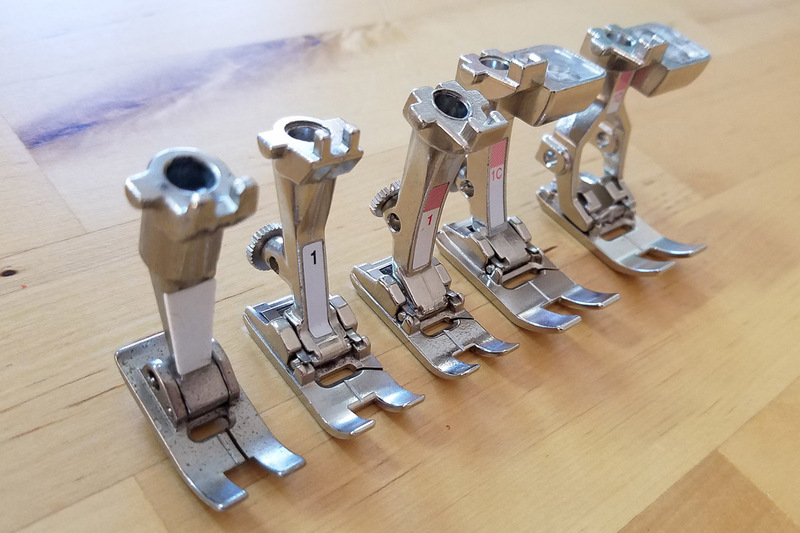 Like so many others, my favorite foot is the #10 edgestitch foot and I have one for each 5 of my Bernina sewing machines. The 0 or 000 foot comes in as a close second. But hands down, it is my #10 edgestitch foot, I would be lost without it. I would update love foot #72, so I could try ruler work. For now it’s 57 for 1/4 inch seams. I like them all and trying to get to become familiar with them (so much to learn) but my favorite-right now- is the 37D. That is because I am also trying to learn to quilt. So many feet and so much to learn and it is all great. I got so excited I didn’t notice the date-guess I missed it. I am really sorry.